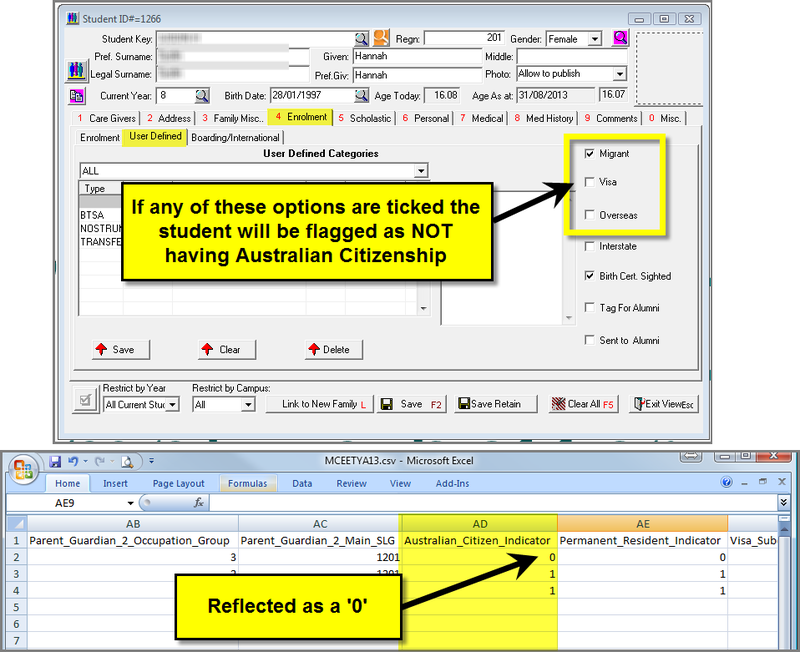 PCSchool has now created an export format that meets the new ACARA (Australian Curriculum, Assessment and Reporting Authority) requirements. Student & Family origin and background information has been entered and Family DETYA addresses have been verified as per the Government Reporting tech tip. NOTE: At present ‘Visa SubClass Number’ and ‘Arrival in Australia Date’ is not stored in a standard field in the database so must be added manually to the csv file once the bulk of the data has been exported. If there are any critical errors they can be seen in the Error Log and will need to be corrected before the file can be Completed / created. 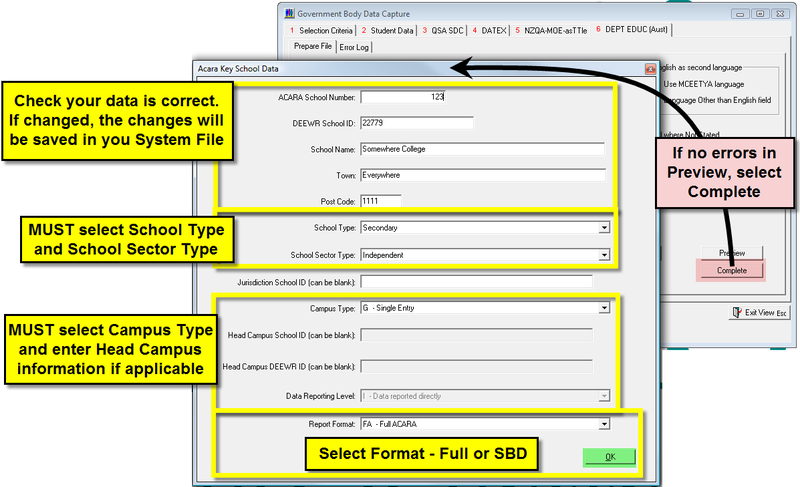 Upon selecting ‘Complete’ the file creation to prompt the ACARA Key School Data screen to appear. You will need to ensure you enter the correct information for your school. 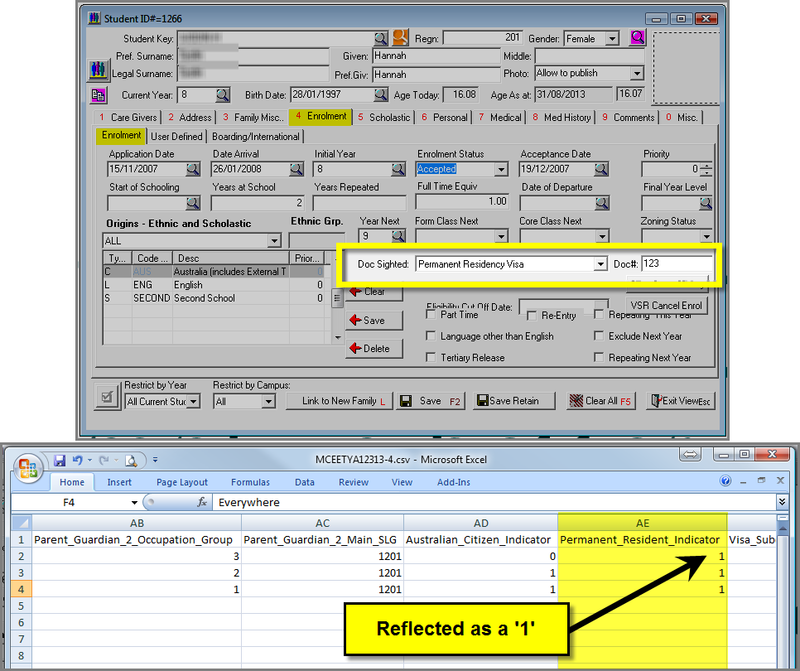 Report formats include the Full ACARA export or a smaller SBD ACARA export depending on your requirements. NOTE AGAIN: At present ‘Visa SubClass Number’ and ‘Arrival in Australia Date’ is not stored in a standard field in the database so must be added manually to the csv file once the bulk of the data has been exported. If you have any problems or questions please contact the PCSchool Help Desk (07 4939 5995 – or – helpdesk@pcschool.net) for assistance. This entry was posted in File Imports / Exports, Reporting to Government and tagged ACARA, Classroom Management, Data Capture, pcschool, school administration software, School Administration System, student management Software, Student Management System by studentmanagementsoftware. Bookmark the permalink.